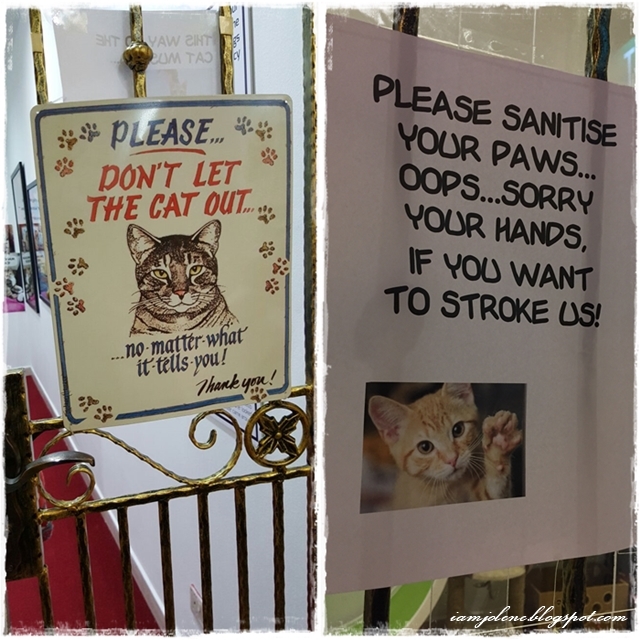 Late last year, I visited Singapore's one and only cat museum -- Lion City Kitty The Cat Museum, Muses and Mansion and boy oh boy was it a PURRFECT experience! All cat lovers would love this gem of a place nestled in a three-floor shophouse space along Purvis Street. 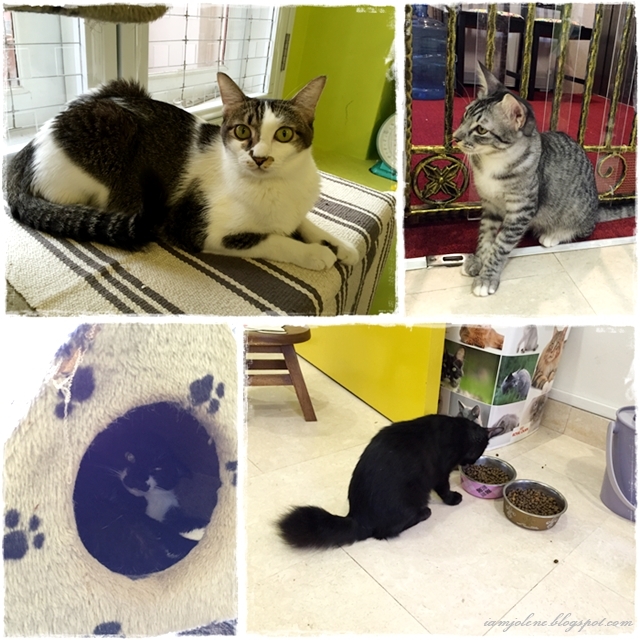 I had always wanted to visit a cat cafe when the first cat cafe hit the shores of Singapore followed by the sprouting of a few more. 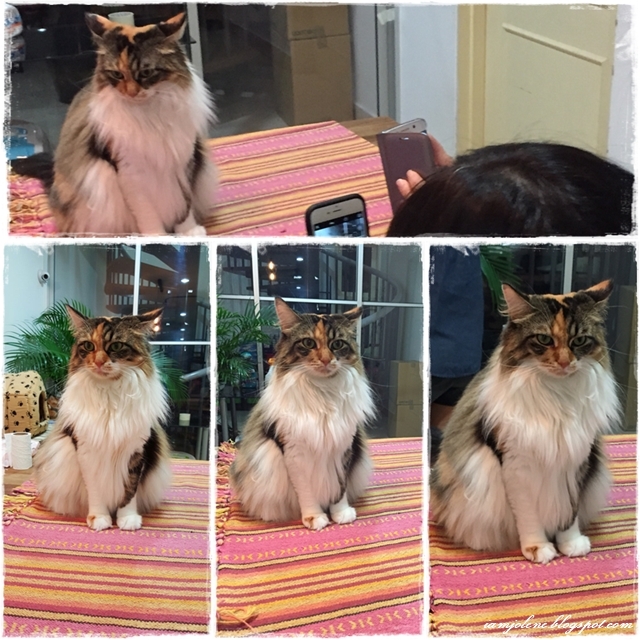 Then, the news came that one of the cafes had several of their cats dying under their care and hence I decided to put back any visits to cat cafes. 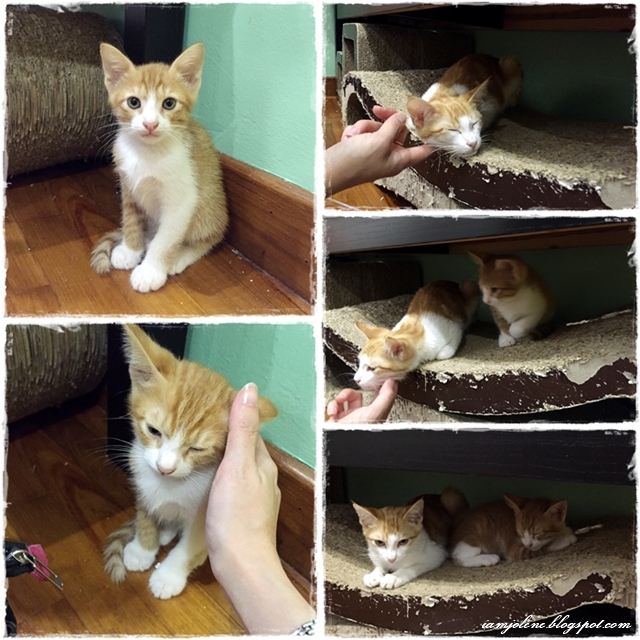 When my gal pal Viv suggested visiting The Cat Museum in Singapore for our next outing, April and I were thrilled. 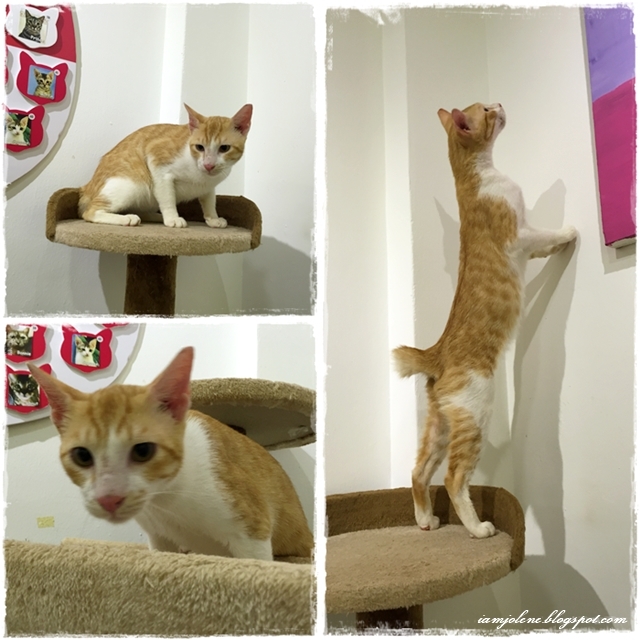 April and I used to keep cats and we were surprised (read: ashamed) that there was even a Cat Museum in Singapore and a social enterprise to boot! 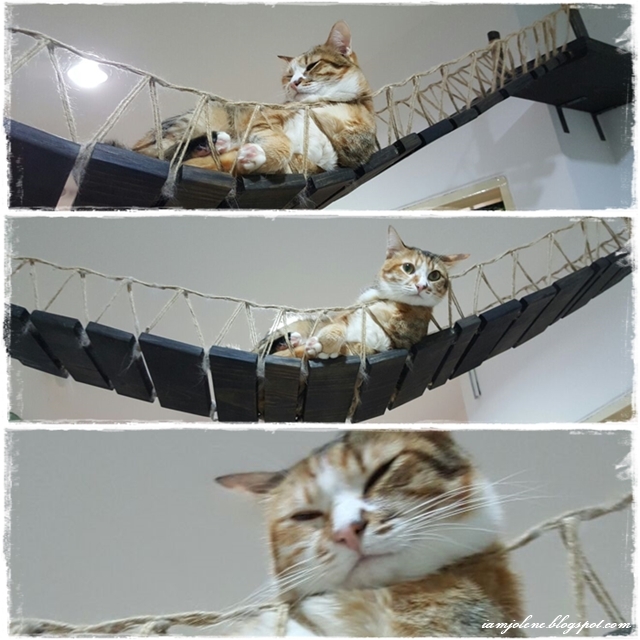 Unlike other cat cafes that have recently sprung up in Singapore, there are no food and drinks served at Lion City Kitty. Also, instead of paying hefty hourly rate to be in the company of kitties like in cat cafes, you only need to pay $9 for admission fee into the museum (free admission for children under 6 years old). 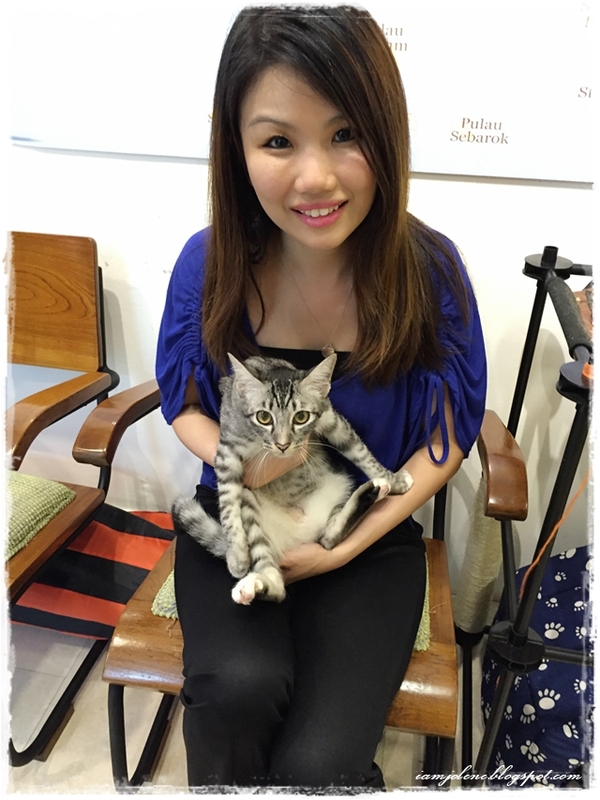 Lion City Kitty is a social enterprise founded by former Gold 90.5FM DJ Jessica Seet as a way to change Singaporeans’ attitude towards the cats we see on our streets as well as to create a genuine interest in them and their kitty heritage. Your $9 would go a long way to helping the kitties there. I've been to Purvis Street a few times and had never once noticed the cat museum. Do look out for this sign and the narrow stairways that would lead you straight up to the 2nd level where your adventure with cats would begin! Once you reach the 2nd floor, you have to remove your shoes and place them in the lockers provided. Have $1 or 50-cent coin handy for the lockers, which would be refunded when you collect your shoes. While I was fumbling for my coin, one of the volunteers came out and told me it was actually alright not to put in any coin as there hadn't been any incidents of missing shoes. In other words, simply put your shoes in the locker without locking at your own risk... and take a meowfie if you want. After putting my shoes into the locker, I made my way through a narrow space which led to the entrance of the museum proper. The cat manning the counter was skiving and sleeping at his desk. I was told his name is Channing Tatum. Of course there really was a human volunteer there manning the counter and I heard from her that Channing Tatum would usually be around that area. 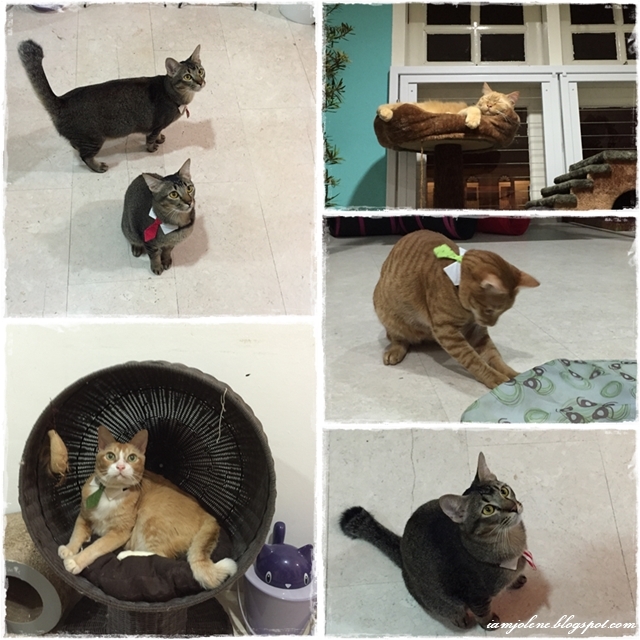 There is a reason why the name of this museum is called Lion City Kitty The Cat Museum, Muses & Mansion. 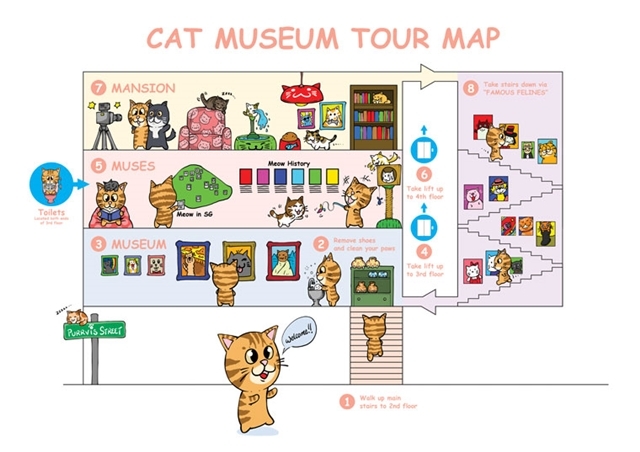 The 2nd floor which some people term as the first floor is the Museum which is decked out with cat paraphernalia and interesting nuggets of information about the history of cats from around the world along with cat-related artwork and photographs. The 3rd floor known as Muses, is where all the rescued or abandoned cats are housed. Partnering the Cat Welfare Society, the cats that roam this cageless environment can be adopted by the public. The 4th floor dubbed the Mansion is the purrfect name as this is where the Hollywood superstars cats live! The cats on this floor are the resident cats who have been given rather famous names - Brad (Pitt), Jen Jen (Jennifer Aniston), Angie (Angelina Jolie), Georgie (George Clooney), Sarah (Jessica Parker), Julia (Roberts), Usher, Shakira and Harry (Prince Harry) the cross-eyed mascot. You could see how they look like here by scrolling right down to the bottom of the page. You could follow the numbers below to tour the place though I personally prefer taking the stairs throughout as I love reading the nuggets of information and kitty quotes, and admiring the cute decorations along the stairway. The volunteer at the counter gave some general guidelines on the dos and don'ts while Channing continued to snooze. You would have to very quickly close the gates behind you when you enter the various floors so as to prevent the kitties from running out. You would also have to sanitize your hands with the hand sanitizer provided at the gates of each level. In case you forget, the friendly volunteers would be around to remind you. Besides learning more about cats and admiring the cat paraphernalia on this level, there are cats roaming the area too. The white cats here have got one blue and one green eye. There was a scrawny little ginger cat which was always bullied by the white cats. There was also a cool cat that reminded me of those thug life memes. In between the flight of stairs to the next level was this cat that was caged up because he was sick and was kept away from the rest of the cats till he recovered. This level was the most crowded of all levels when I visited on a Friday evening. I almost went crazy at this level because of the sheer number of cats available for adoption! I texted Viv and April my last text to inform them that I'm gonna immerse myself in this awesome Kitten Kindergarten and would just wait for them to locate me when they reached. 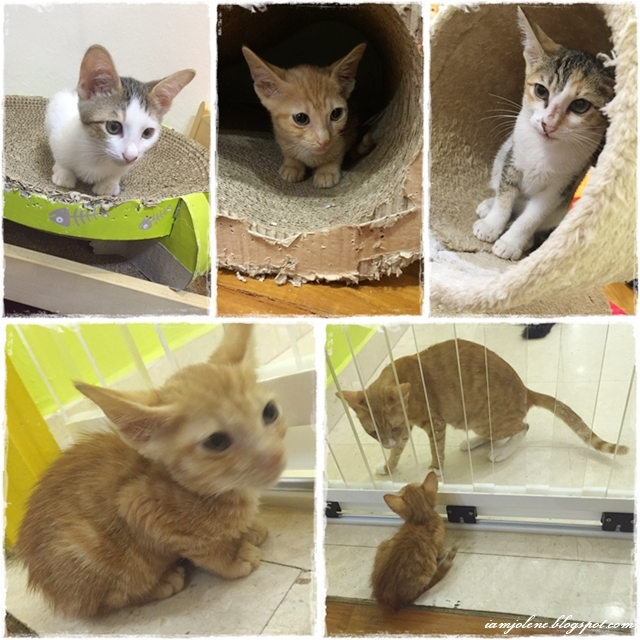 The Kitten Kindergarten is the favourite place for most people (and the most crowded) because who doesn't love little kittens right??? The kittens ranged in size from a large kitten/ small cat to the really tiny ones. You have to be seated in the Kitten Kindergarten so as to avoid stepping on the tiny kittens and also to appear smaller and less intimidating to them. There were kitty teasers every where for you to play with the kitties though sometimes, they prefer to play with every other object other than their toys. 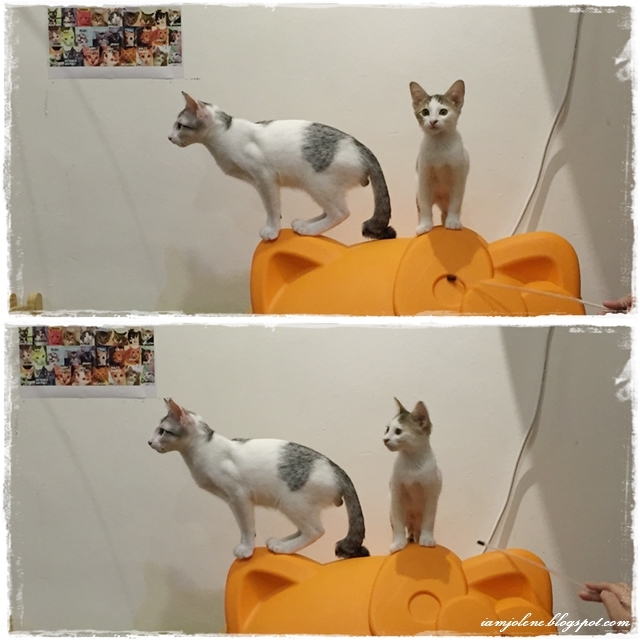 Very soon, Viv and April arrived and knew exactly where to find me just like how this mama cat found her kitten. This ginger kitten is the smallest kitten in the whole kindergarten. See how small she was! Sorry I don't mean to be rude and point. Don't look awayyyyyy. I lurve the spots in the grey patches of this kitty. 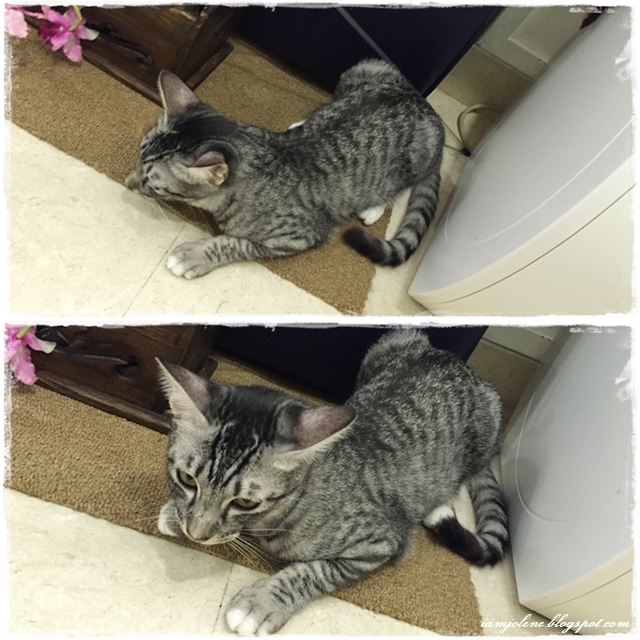 I seldom see such fur pattern in stray cats of Singapore. His name is Gandalf. His other Lord of the Ring siblings had been adopted then except him. I heard from the volunteers that he was really too active and I could really tell! One minute he was in front of me and the next, he was at the door, and the next he had climbed all the way up to the top of the window! Mean April remarked, "What? He is Gandalf? Gandalf is the elegant wizard right? This cat's behavior is more like Golum!" You really have to look out for kittens every where. I did not dare to lean against the wall after I felt a soft little pillow supporting my lower back when I did and then a moment later, the little pillow bounded onto my lap. Viv's favourite kitty is the one sleeping in the basket of the cat condo. She also liked the one sleeping on the cowboy hat. I told her that she found all the sleeping ones cute coz their eyes were cute little slits. 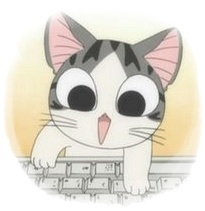 There were cats named after tea. There were cats named after coffee. There were cats named after celebrities. I remembered all their names the next few days after the visit when I showed my sisters and other cat lovers the photos on my phone but have since forgotten their names as I'm typing this many moons later. Somehow these sweeties looked like they were on a giant cake. I feared for the kitties when I saw the multi power points but none of them seemed to even bother about the wires. Good kitties! Trick or treat or me? Still on the same floor but outside of the Kitten Kindergarten were the adult cats that had been rescued and up for adoption as well. This black kitty had got a fluffy tail and white eyebrows that reminds me of my sis's kitty called Luke Oreo. Long lean kitty trying to paw some invisible thing on the wall. We guess it was a lizard behind the picture. I love the tabby markings of this grey cat called Ariana Grande. Dubbed The Mansion, this cosy area as mentioned earlier on houses the superstar resident cats. I personally found the cats at this level with a more diva disposition. Perhaps it was getting late too. Night had fallen by the time we were about to leave the 3rd floor for the 4th. Had the gals not reminded me that we still had a level to explore, I would have spent all the time at Muses. Told you they were superstars. All the paparazzi went a-clicking. 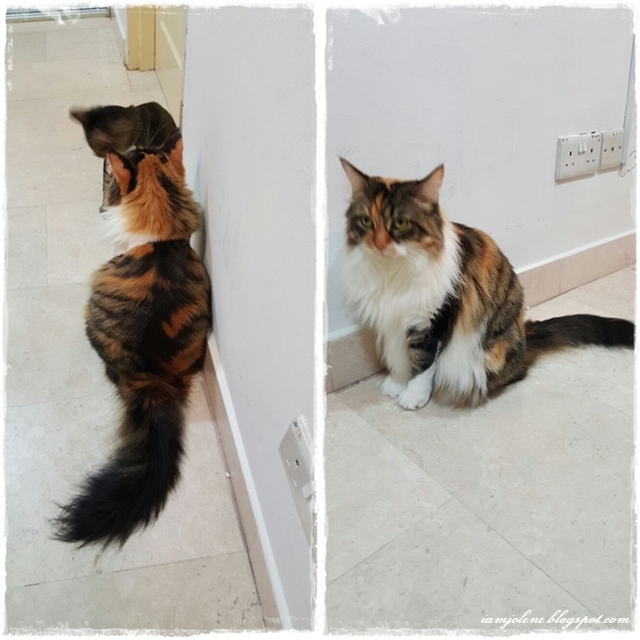 Meet Angie the mainecoon abandoned by her breeder. She has the typical Angelina Jolie's sour puss face. Meet her sister Jen Jen, also a mainecoon of course abandoned by their breeder. I have never seen a cat with such beautiful fur. 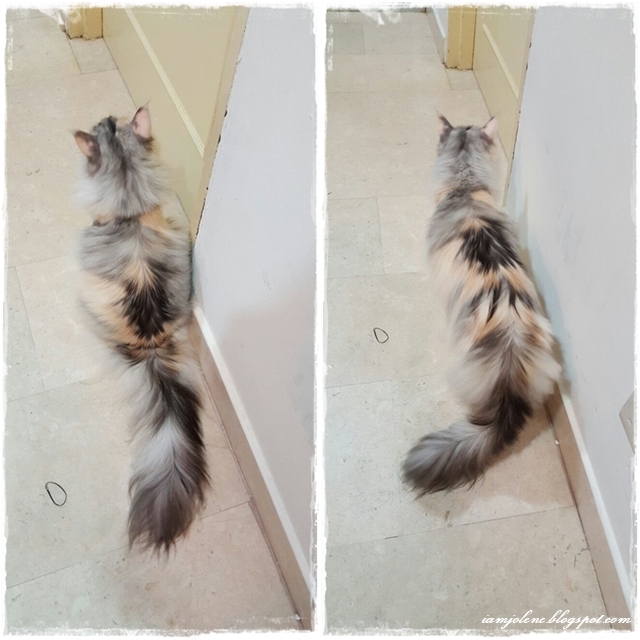 Look at that full furry tail! Bimbotic April was so jealous of her hair. Lol! No wonder she is Jennifer Aniston! She has more beautiful hair than any of us. You have to meet the grumpy face Brad Pitt too! A British Shorthair and Persian mix, he is the only cat that was bought. He is just so funny to look at. We were told that we were really lucky to see Brad walking. Usually he would just be lying around. Wanna know how big Braddie is? Look at my hand in relation. Meet all the other cats on this level whom I have forgotten their names. After having so many pictures of cats, we found a great backdrop for human shots. 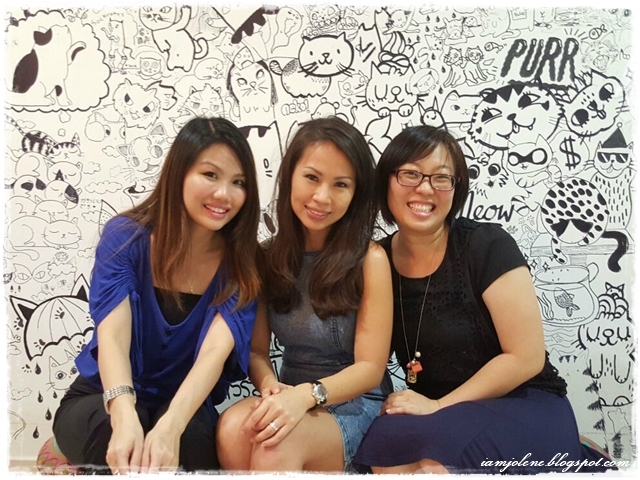 Presenting the humans who had great fun at Singapore's only cat museum. I'm biased. 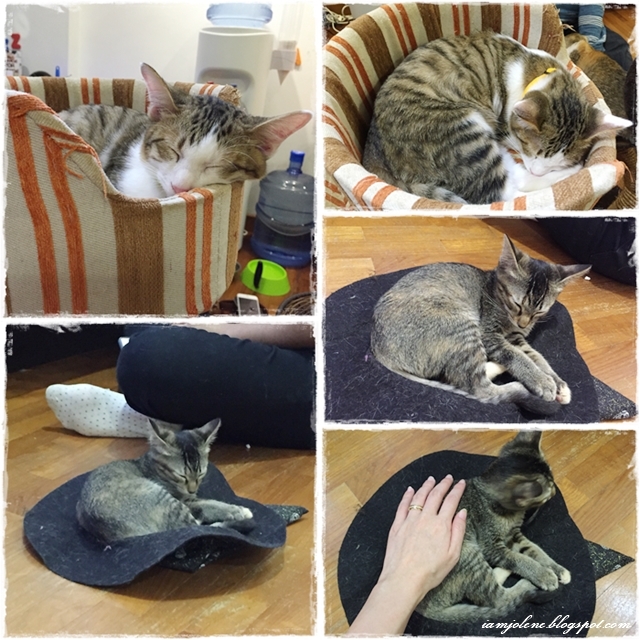 I haven't visited any cat cafes before but this is definitely better than any other cat cafes. 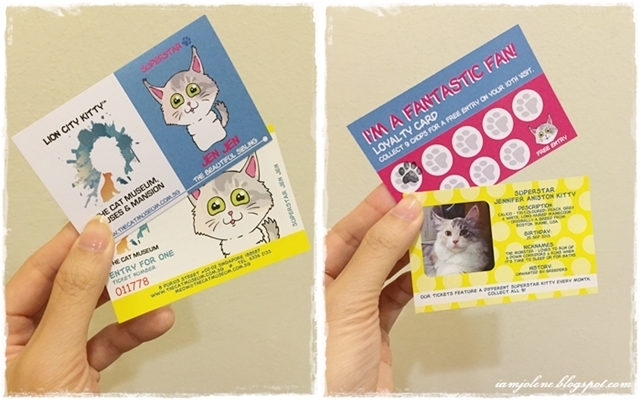 It is a social enterprise and is not for profit so the ticket fees and sale of products go into the maintenance of the cats. Before you head down, do note the museum operation hours. This is not set up to be a commercial business and is not open daily to prevent stressing out/ overstimulating the cats. Visiting Lion City Kitty The Cat Museum, Muses and Mansion?